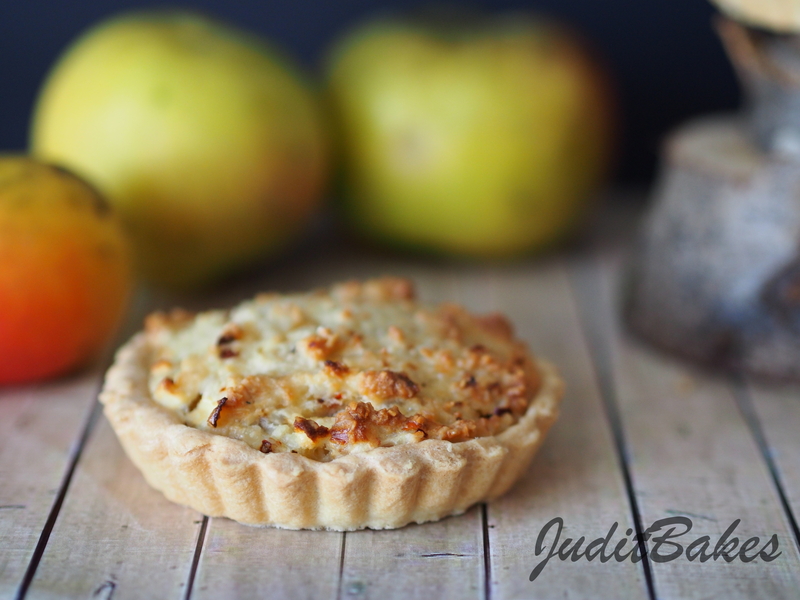 Forever Foraging: Apple and Cheese Frangipane Tartlet | When Judit bakes...bread and better.. Autumn is the time to forage for crab apples. The trees grow up to 10 metres tall. There is a difference between the true crab and its cultivated versions. The true crab (Malus slyvestris) is thorny with cupped, five-petalled flowers and oval, toothed leaves. The fruit is round and about two centimetres in diameter. If cut horizontally, it’ll have the star shape of an apple core, without a single seed. ‘Wildings’, which are apples from discarded pips and some cultivated crab apples, won’t be thorny. The fruit is very tart and appear in a variety of colours. They ripen from October. Crab apples are very high in the setting agent pectin and so they help make great jams and jellies when accompanied by low pectin fruit such as blackberries, rowan berries and rose hips, which also ripen at this time. Apple jelly is great with herbs and savoury dishes, resulting in fresh, sharp flavoured food. 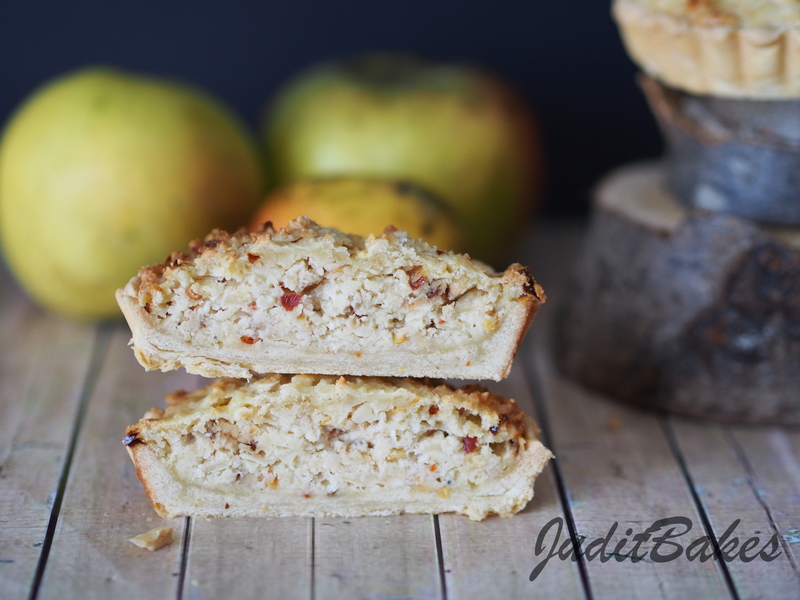 Apple also pairs well with spices and cheese. Put the flour and salt in a large bowl and add the cubes of butter. Use fingertips to rub the butter into the flour until mixture resembles coarse breadcrumbs with no large lumps of butter. Using a knife, stir in just enough of the cold water to bind the dough together. Wrap the dough in clingfilm and chill for 10-15 minutes before using. Roll out the dough thinly. Butter and flour the tartlet pans, and spread the dough evenly inside and up the sides, cutting off the extra. Prick with a fork. Chill for at least 30 minutes. Preheat the oven to 190 degrees C. Remove the chilled pastry from the refrigerator and bake for 15 minutes, then spread the frangipane evenly over the crust, leaving a a little border. 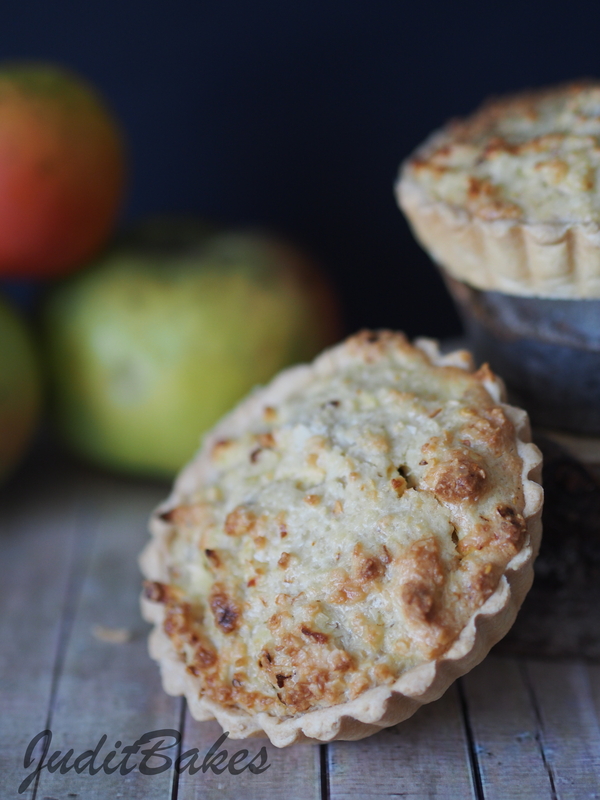 Bake the tartlets for another 20 to 25 minutes or until the crust is golden brown. Remove from oven and place on a wire rack to cool. 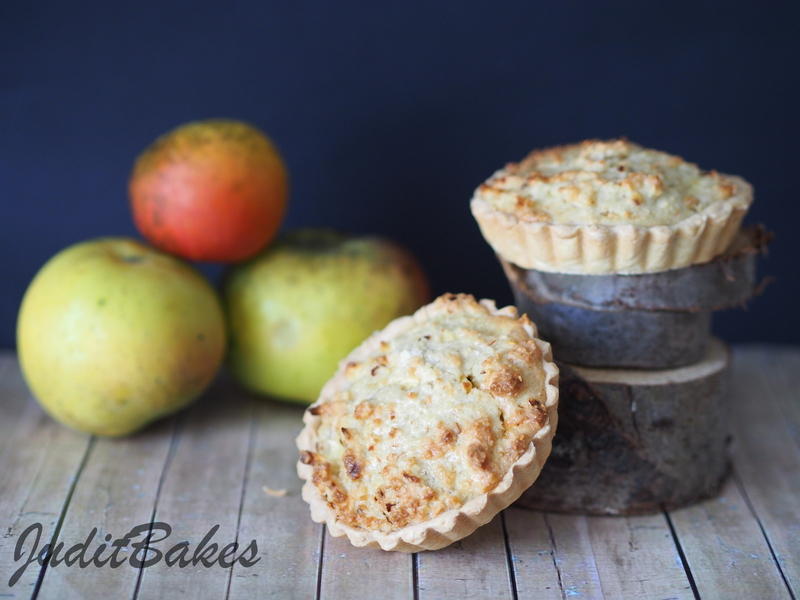 This entry was posted in Baked treats, Foraging, Just Everything, Savoury bakes, Seasonal Baking, Tarts, Treats for Life and tagged Apple, apple jelly, Crab apple trees, crab apples. Bookmark the permalink.